The fizzing JSM will be taking their high energy InterCeltic act across England and Wales from Saturday, November 12 – December 2nd to arts centres, theatres and universities. 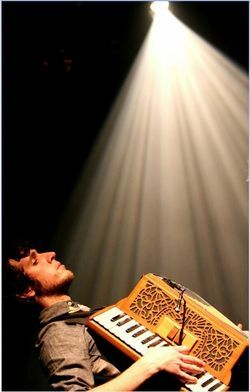 Formerly known simply as Mabon (meaning autumn equinox), the prodigiously talented JSM are fast making their unique and vibrant mark on the roots scene, led by tunesmeister and accordionist extraordinaire Jamie Smith. This milestone year has seen the all-male line up make a triumphant debut at the world’s largest winter music festival – Celtic Connections – as well as their WOMAD debut on the BBC Radio 3 stage, and many memorable performances including Fylde Festival, Priddy Festival, Bristol Folk Festival, Llangollen International Eisteddfod, Carmarthenshire’s Small Nations Festival, Cardiff’s St.David’s Hall and Bristol’s Colston Hall for the Schumacher Festival’s Small World concert. Exciting shifts in style and sound have seen songs, penned by Smith, enter the set - including the aptly named "Yes We Sing Now"(!) But it is Smith’s inspired, eclectic tunes that continue to dominate the material that delves into every Celtic corner – from their native Wales to Brittany, Scotland, Ireland, Galicia and beyond. His prolific and imaginative compositions take audiences on a magical whistle-stop Euro tour with jigs and reels jostling for space alongside other dance-related forms including Breton an dro, French mazurka, Galician muinera and even shades of klezmer in an exuberant, unstoppable, feelgood show. 2012 is already looking like a busy year for JSM as they work towards the release of a new studio album to be officially released in the autumn and take their stand-out live act to numerous festivals in the UK and across Europe.